Disclosure: I admit to being in the throes of a bread addiction. I admit that this really is not a bad thing. I admit that I feed my habit at Panera Bread on a frequent basis. I also admit that I am being compensated for sharing about Panera Bread. And I further admit that the thoughts and opinions stated here are my own; Panera has not paid for my positive thoughts nor do they have any responsibility in my bread addiction. So last month, I shared about deep and undying love and appreciation for Panera Bread. I was so thrilled to read that many of you feel the same way. There’s strength in numbers, my friends. 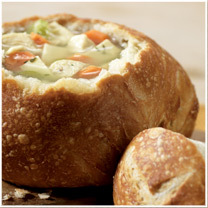 Personally, I love knowing that I’m not the only one who has an obsession with soup and bread bowls. This month, let’s dig a little deeper into Panera. We all love their food, but just what is it that makes that food so good? Quite simply, it’s quality. Panera prides itself on using quality ingredients to create quality products. They use the phrase “simple fresh ingredients” to describe the secret behind their amazing tasting food. It seems almost too easy, doesn’t it? But since I know so many of you are well acquainted with Panera Bread, I know you’ll understand what I’m talking about when I say you can taste that motto in every bite. I know my love for soup is no secret. But now let’s talk about my love for bread. I’m a carb-junkie through and through. When it comes to the bread served up at Panera, I haven’t met a loaf I didn’t like. I’m partial to the crusty crunch and soft center of sourdough or any of the cheese breads, but I’d happily eat up any one of the loaves they offer. What’s your favorite bread from Panera Bread? I absolutely want you to share your bread passion here, but then consider sharing it over at Panera’s facebook page on the Ode To Bread section. I can wax poetic about the tummy tingling goodness of a warm, crispy loaf all day. How about you? I love the bread from Panera and I also love making my own homemade bread. Those two things do not have to be mutually exclusive. I have such respect for Panera Bread and their encouraging of making your own bread. If you want some Panera-style bread baking tips straight from their head bread baker, you have got to watch this video on Baking Fresh Bread from Fresh Dough. Awesome stuff! And now, let the Panera Bread obsessed conversation commence once again. Let’s discuss the quality, the fresh ingredients and the bread…oh, the bread! They DON’T use quality ingredients though… Not unless you consider HFCS and other chemicals and preservatives quality. I was shocked when I picked up a cookie from there and saw the long list of ingredients. Yep, I started buying loaves of bread from them when I didn’t have time to make my own thinking that I was getting fairly high quality bread that we loved eating. Then I look at the ingredients list and was dismayed at the HFCS, among other things. It’s yummy but now I look at it as an occasional treat, sadly. I’ve actually never bought Panera bread – we usually stick to their soups and pastries – but I love the little chunk of bread they always serve with their soups. Yum! I make all our bread for eating, but if there was ever a week when I ran out of yeast or was too tired to bake, I would definitely be stopping by Panera for a substitute.